For more details about the various phobias, visit this Phobias Introduction page to see Phobia Variations Defined and Explained. There are only two forces that unite men: fear and self-interest. Anyone who has an abnormal fear of mites, other small insects, or worms: Janet, being an acarophobiac, always seems to have an irrational dread of being bitten by tiny bugs of any kind. An extreme anxiety about consuming sour or bitter tasting foods or liquids: Individuals who are affected by acerbophobia avoid eating anything that is even slightly unsavory or distasteful. 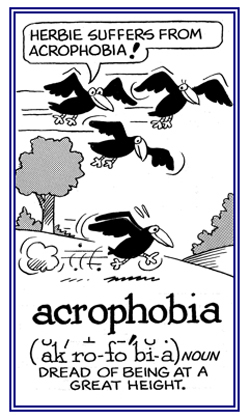 A term indicating an abnormal nervousness about having any sharp tasting edibles or liquids: Acerophobia is used for people who cannot tolerate foods which they consider to be rancid or stale. A horror of being in the dark or existing in any unlighted areas: An achluophobia involves not going out at night, increased anxiety as evening approaches, not wanting to look outside the window in order to avoid seeing the nocturnal environment, avoidance of looking into dark rooms, and always having some kind of light available. In botany, the intolerance of some plants to exist in acidic soils: The acidophobia of some flora means that they can only survive and grow in soil having some lime or by having fertilizers containing calcium and nitrogen. A reference to plants which cannot grow in acidic situations: Examples of acidophobic vegetation include alfalfa and clover, which are grown for fodder. An uncommon and overly apprehensive concern about sounds: An elderly woman who had lived many years without any contact with friends, relatives, or other people, was overly sensitive to any noise that she did not cause and so it is proper to assume that she had a condition known as acousticophobia! A great hatred of certain insects based on the vast amounts of destruction which are caused by such bugs: Acridophobia involves disastrous swarms of grasshoppers and locusts that are like gigantic-living tumbleweeds that roll onward, during which the forward edge descends to feed as others pass over-head and those that are left behind rise up and rejoin the hoard as they move on to consume other areas of vegetation. An excessive discomfort of heights, elevators, climbing ladders, pinnacles, etc. ; a dread of sharp points: Acrophobia is one of the most common fears among people. Those who have acrophobia are afraid of being on high floors of buildings or even on the tops of hills or mountains and they often feel overly anxious when they approach the edge of bridges, rooftops, stairwells, and railings. Sometimes individuals who are afflicted with acrophobia not only have an excessive fear, but they feel an uncontrollable urge to jump off. There are some people who suffer from acrophobia and also have fantasies and physical sensations of falling even when they are standing on firm ground. 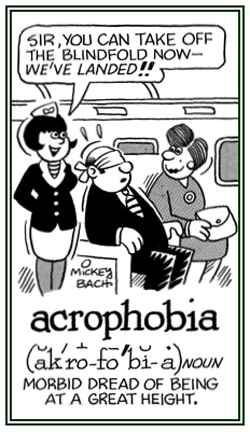 Those who are affected by acrophobia in moving platforms for people, or on escalators, balconies, and stairways are probably related to the fear of altitudes just as they are with the terror of flying in aircraft. A person who has a strong feeling of panic when he or she is in high places of any kind: Linda discovered that she was an acrophobic after experiencing the breakdown of a glassed-in elevator which was located on the outside of a building. For one man, life was an unnerving affair. The "high anxiety" of a twenty-seven year old civil servant suffered from a condition that restricted both his personal and professional lifestyles. His walk-up apartment in the city where he lived was about six feet above ground level which he considered "safe" enough. He worked on the fourth floor of a downtown office building where he generally avoided windows. If he looked out, it was straight across at the windows of a neighboring building. He didn't dare look down at the hustle and bustle below. This phobic always walked the four floors, up and down, because the elevator was a "no-no" for him. His acrophobia made him avoid high rises, airplane rides, and car trips through mountainous areas. Jaunts to trendy penthouse restaurants were out, as were midway and cable car rides and such "in" sports as mountain climbing, sky-diving, and hang-gliding were obviously out of the question. "Height makes me light-headed. I start to tremble and talk reassuringly to myself. If I look down to the ground from a high place, I feel nauseous and want to vomit. I have an overwhelming urge to get out of there, just to get away." Although it meant personal sacrifice, this acrophobic learned to live with his phobia. "So far I've been able to get around it. I just don't go to high places. I can find alternate places to go, and other things to do." Our work is never done. Millions upon millions of secret fears and phobias lurk known and unknown in high and low places of civilization that have yet to be, and must be, leached out of man's progress for his betterment. —Dr. Andrew S. Zunotto, Psychiatrist. Showing page 1 out of 47 pages of 703 main-word entries or main-word-entry groups.